USD/JPY is dropping on a risk-off sentiment related to the reported downing of two Indian planes by Pakistan in what serves as another escalation of the conflict related to the disputed Kashmir region. What’s next for the pair? The Technical Confluences Indicator shows that dollar/yen faces fierce resistance at 110.66 which is the convergence of the Fibonacci 61/8% one-week, the Bollinger Band 15min-Upper, the BB 1h-Middle, and the Simple Moving Average 5-4h. The way up is a minefield of resistance lines culminating in 111.01 which is where last week’s high converges with the Pivot Point one-day Resistance 1, the PP 1m-R1, and the BB 4h-Upper. On the downside, USD/JPY has only weak support at 110.05 where we note the confluence of last month’s high with the Pivot Point one-day S2. 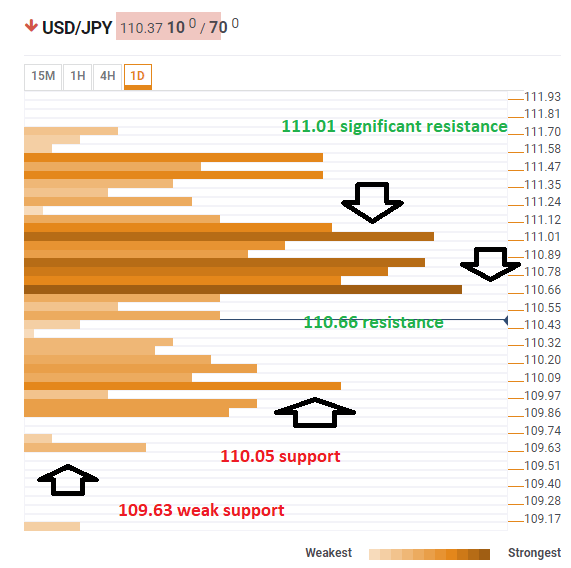 Even weaker support awaits at 109.63 where we find the Pivot Point one-week Support 3. All in all, the path of least resistance is to the downside.